What would be the subject of a second Brexit Referendum? At the moment (Sept. 2018) there's a discussion in the UK whether there should be a "second referendum" on Brexit. In the media there's already a discussion how people would vote. But upon what would they vote? The initial referendum was fairly clear. Should the UK leave the EU, following the Article 50 procedure? This was an option that was available to the UK, as it is a sovereign country. Parliament could decide, and therefore Parliament could also decide to ask the voters. Today however the UK has committed itself to leave the EU by March 2019. There are discussions over the exact terms of a secession agreement. But if no agreement could be reached, a no-deal Brexit would happen. This gives one possible interpretation of the "Second Referendum" - is the proposed EU-UK agreement acceptable, or should the UK choose for a no-deal Brexit? This is of course only possible if there's a proposed agreement in the first place. Voting on "Chequers" (May's current idea of Brexit) is pointless, as the EU already turned it down. Or would the "Second Referendum" instead be the same choice between Remain and Leave? Media polls seem to suggest this, but I don't see how this is an option. The UK cannot stop Brexit anymore, not even if 60% of voters would want to remain. It's the EU which would have to stop Brexit, and do so unanimously. And that seems beyond farfetched, with the current internal strife (Poland and Hungary at the brink of losing their vote, Italy being annoyed at the other 26 not taking refugees, Greece still sore from the bailout). Or am I overlooking a third option? Is there some other Brexit matter where the UK can and must make a yes-or-no choice? As of September 2018, the answer is that nobody knows. A first unknown is whether there will be a deal to vote on. Clearly, if there is no deal, then "accept the deal" can't be on the ballot paper. A second unknown is whether, having triggered Article 50, the UK can unilaterally untrigger it - though EU leaders have said on several occasions that they would accept the UK back regardless. Under the terms of the European Union Withdrawal Agreement (Public Vote) Bill 2017-19, the question would be to either accept the deal or to remain in the EU. John MacDonnell, shadow chancellor, said (without endorsing the idea) that any second referendum should assume the result of the first, and that the question should thus be whether to accept the deal, or reject it and leave with no deal. Meanwhile, Justine Greening, former Education Secretary, has advocated a three-way vote with preference voting. Finally, clearly if there is no deal to vote on - perhaps the least implausible scenario that leads to a second referendum - the only possible choice would be whether to remain in the EU or leave with no deal. The point I think is that the choice of question depends on the circumstances in which the referendum is called - who calls it and why. Most of the campaigners in favour at this point are disappointed remainers, who will endorse versions that have a remain option and don't necessarily care which leave options are available. But if it's called by the pro-Brexit side, the deal or no deal version would seem more likely. Or would the "Second Referendum" instead be the same choice between Remain and Leave? Media polls seem to suggest this, but I don't see how this is an option. Any such referendum is internal British politics. They are to instruct (even though the second referendum, like the first, probably won't be binding) British politicians on how to proceed. If the majority of people now voted to remain, then British politicians can (this is possible for sure) follow that instruction by changing their negotiation position to maintain as much regulatory alignment. Additionally, they can try to negotiate with the EU to cancel its exit all together (if this is possible depends on the EU and its rules). Alternatively, they may try to negotiate a reentry (though that would be complicated because the EU has strict requirements for becoming a member). This is of course only possible if there's a proposed agreement in the first place. Theoretically, these could all be options in the referendum. Basically, any of these options indicate a balance between alignment and divergence from the EU. That doesn't mean these options could be copied 1:1 and be agreed upon, but they can serve as a basis for negotiation by the UK (without breaking EU rules, because similar deals already exist between the EU and other countries). The diagram illustrates existing arrangements between the EU and other countries. The more to the left in the diagram, the more integrated the country is with the EU and its policies. Being more to the right indicates a country less integrated with the EU. The first option is being an EU member, which is the most integrated with the EU a country can be (this option is quite obvious). 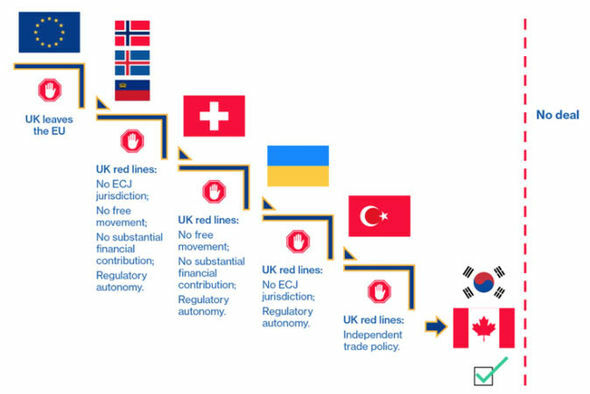 Underneath the EU flag it indicates a red line, which means that red line prevents this option from being feasible. Indeed, 'UK leaves EU' means it cannot also be a member of the EU. The second option is a Norway-style deal. Norway is not a member of the EU, but it does accept ECJ jurisdiction, free movement of workers, substantial financial contributions and it does not have regulatory autonomy. If the UK does not accept one or more of these restrictions then the Norway-style deal is off the table. The third option is the Swiss-style deal. This deal still requires free movement, a substantial financial contribution and does not allow for regulatory autonomy. The difference with the Norway-style deal is that there is no ECJ jurisdiction. Instead, there is another mechanism in place (this is quite complicated, this article by the Guardian touches on that). Going further to the right, the options can be read in the same way. At the very right there is a line saying no deal. This means that if the UK does not accept any type of concession then a deal is not possible at all. As Hedgehog points out, the contents of a (possible) second referendum are not clear (yet). In that answer, it's pointed out that a high-ranking Labour politician argues the result of the first referendum should be assumed. On the other hand, others within the Labour party have suggested not ruling out remain as an option. The PM wrote a column earlier this month stating clearly: "There will be no second referendum on Brexit – it would be a gross betrayal of our democracy". The UK should leave the EU with no deal. The UK should accept whatever deal the government gets. The UK should ask for an extension and try to negotiate a better deal. The UK should accept a "Norway Deal" as offered by the EU. The UK should remain in the EU. Obviously some of these can't be asked under certain circumstances, such as the UK government failing to get any deal. There is also the issue of balance. The question would have to be approved by the Electoral Commission which would be looking to ensure that it is fair, so for example having two options for leaving and one for remaining would likely split the leave vote and be unacceptable. So for practical reasons two opposing positions would have to be selected. There's a cynical and a less cynical answer to that. The cynical answer is that for the past maybe two decades, it has become more and more acceptable to repeat elections and referendums until the result is something that the politicians can manage. This has happened in national elections in EU countries many, many times in that period. If no ruling coalition can be formed, we get new elections instead of a minority government working with compromises to secure varying majorities. The less cynical answer is that the situation is not the same now as it was immediately prior to the first referendum. There are a lot more details known and more clear choices are on the table. A referendum can present more specific choices with specific consequences. If the first referendum was picking your holiday destination, you've now checked flight and hotel prices and are considering again - which may include a change of destinations. Do you want to leave the European Union or remain on existing terms? If you want to leave should we do so on the basis of the deal that has been agreed or leave without a deal? As of mid December 2018, the EU has made it clear that the UK can withdraw from the withdrawal process. So the obvious choices are: (1) Remain or leave. (2) If the majority is for leave, leave with the current negotiated deal, or leave with no deal. Hadn't noticed that the Scottish Conservative Party was quicker :-) But it is the only rational choice. Not the answer you're looking for? Browse other questions tagged united-kingdom brexit or ask your own question. Is there a good breakdown by ethnicity (white British, etc.) of how people voted in the Brexit referendum, both in Britain as a whole and in London? Why doesn't the UK hold a second Brexit referendum to clarify what the public wants from Brexit? What reason(s) have UK politicians given for not wanting another referendum on whether the UK should exit the EU or not?